All analysis has been performed on public-domain data. Microsoft Excel 2007 spreadsheet for browsing (75.4MB): The spreadsheet has easily sortable columns and human readable column names, but only has a selection of the columns in the full data. Normalised Microsoft Excel 2007 spreadsheet (76.9MB): The spreadsheet has all columns and the zip file also includes documentation as web pages. This used data from Scopus to give a profile for each area. For each area and age of publication it gives the number of citations required to put the paper in the top 1%, 5%, 10% or 25% of papers within its area. The full spreadsheet covers all academic areas, but the computing topics are reproduced in this excerpt. This has been widely distributed and a copy is here. 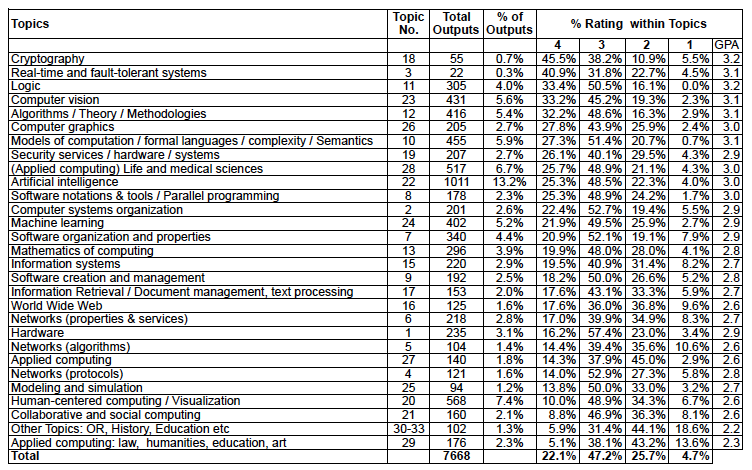 Table with 4*/3*/2*/1* profile for each sub-sea of computing using the ACM codes provided as part of the submission. 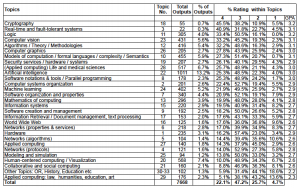 Cross tabulation of Scopus citation counts and REF scores. The following of CSV and JSON files contain data derived from the raw REF submission data. outputs_with_google.json — The above in JSON format (often faster and easier to read than CSV). g_outputs_with_scores.csv — Copy of outputs.csv with five extra columns. ‘ACM_Code’ is the ACM code as previously described. ‘Context_Code’ is the code from the REF contextual data. ‘Q_Score’ is a quartile score based on Scopus citations; high is best: 100 means top quartile, 25 bottom quartile and 50, and 75 and the middle quartiles. ‘C_Score’ is a score based on the REF contextual data; low is best: 1 means top 1% in its area worldwide, 5 top 5%, similar for 10, 25 and 100 means somewhere in the lower 75% of outputs. ‘G_Score’ is calculated the same as ‘Q_Score’, but using Google scholar citations. In each case a blank field means the data is unavailable. g_outputs_with_scores.json — The above in JSON format. You may already be aware, but in case of interest, here’s a listing of gender and ECR gaps in REF2014, taken from the metric tide suppl-2 report. Enjoyed your analysis and links, very helpful in thinking about analysis in social sciences. Many thanks for the link Steve. I’m due to write about the gender issues in a little more depth, so very useful.